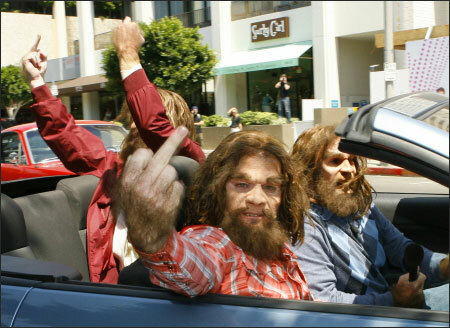 Three cavemen, apparently from ABC’s Cavemen sitcom (based on the Geico ads), were photographed in L.A. this week looking more aggrieved than usual—and more hostile as well. Perhaps the show’s recent retooling has de-emphasized the characters’ wimpy, PC righteousness and turned them into violent hoodlums. (Not the worst idea.) Whatever the case, they’ll want to keep an eye on their road rage if they want to keep their car-insurance rates down.